When you see that sparkling new metal roof up on your home, or a house you drive by, do you ever wonder how it was actually made and what goes into the process of manufacturing a metal roof? A standing seam metal roof is the most popular of all metal roofing systems, in part because it can be roll-formed by roofing contractors on a job site, or in a sheet metal shop, to the exact specs provided by the contractor. In other words, you don’t need to “deal” with big manufacturers when getting a standing seam roof. But lets take a step back and actually explore the manufacturing process of a metal roof, from the iron ore mine to your roof. All standing seam metal roofs go through a roll-former – a machine that turns a metal coil into actual metal roofing panels. 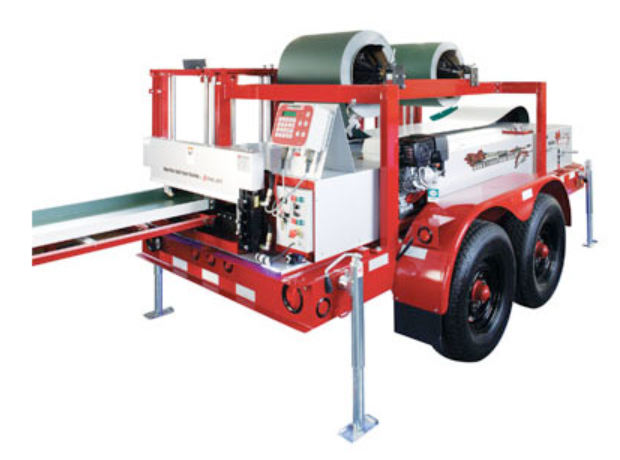 The roll former machines can be outfitted with different panel profiles, mechanized or manual shears, computer controller unit, portable or stationary platform / trailer, uncoilers, built-in 10,000 watts generator, and other upgrades, depending on the purposes of its use and how much you want to spend. MetalMan Roll Forming Machine by Englert Inc. The basic process of making standing seam panels involves feeding metal coil into a roll-former. – Once inside a roll-former, the metal coil goes through a series of rolls, which make bends and curves. – Each successive roll makes more of a bend than a previous one. These rolls are made of hardened stainless steel for increased lifespan and durability. Some can bend a metal as thick as 22 gauge steel. The rolls make up different standing seam profiles, such as Snap-Lock standing seam, Snap-Lock with a nailing strip (no clips required, when fastening these metal panels to the roof), Mechanical Lock Profile, R-Panel, V-5 Crimp panels, and many other exotic profiles. A panel width can be manually set on each roll-forming machine, but typical widths are 12, 16 and 20″ wide panels. Panel width is actually dictated by a metal coil being used. For a 12″ wide panels you need a 16″ coil. The “extra” 4 inches are not shaved off inside a machine – they actually go into making the locks on each side of the panel. The computer control unit takes care of the machine operation / speed, panel length, etc. A smart control unit with automatic shear, can pretty much automate your manufacturing process, by running the coil at specified speed and cutting it at specified length. For example you can program it to produce 10 panels at 28′ 3″ and 25 panels at 24′ 6″ and it will do just that – at required length, the machine stops, the automatic shear cuts off the panel, you pull it out and the next panel starts rolling out of the machine. 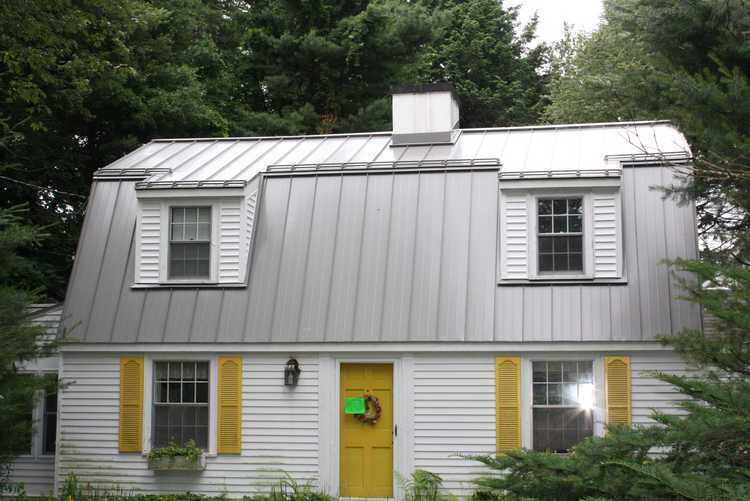 Besides the actual metal panels, there is also a lot to manufacturing a metal roof that escapes the eye – namely, making all the accessories for a metal roof: the drip edge, rake / gable trim, valley pans, ridge cap, z-bar flashing, sidewall and head-wall flashing for roof to wall connection, chimney and skylight curb flashing, etc. All of these items require precision manufacturing and are absolutely necessary for any type of vertical panel metal roof. All these metal roof flashing is made in a sheet metal shop, on highly sophisticated, computerized sheet metal brakes, which can also be programmed to increase the speed of making the most popular profiles of metal roof flashing. The way that a computerized brake is different from a manual or a hand brake is that when using a manual brake you have to manually measure, mark and set up the depth for each bend to happen, and you have to do it on each side of the metal strip to be bent. While this is a viable option, it is very slow, labor intensive and not very precise. The computerized or automatic sheet metal brake, which is a necessary attribute of any good sheet metal shop, has special “fingers” or stops that will let you insert a strip of metal only so deep inside the brake, and the hydraulic bender, will make the bent. These computerized brakes are very heavy duty and can easily bend metal that is 22 gauge or thicker. Even a 3/16″ thick metal (aluminum and steel) can be bent in a heavy duty industrial brake, but for metal roofing it is an overkill, as a typical thickness rarely exceeds 24 gauge metal in residential application and 22 gauge in commercial profiles. Besides a sheet metal brake, a metal shop needs an automated hydraulic shear to cut strips of metal to the required width, so that a brake operator can quickly produce required components and not worry about having the pieces of metal cut. Beside the shear, the break, and other smaller specialty tools, each sheet metal shop has some heavy duty racks, where the metal coils, sheets of metal and already produced flashing accessories are stored, and a fork-lift to load and unload all the coils and other heavy stuff. Shop workers cannot lift a typical 2,000 or 3,000 lb. metal coil on their own. The bottom line is that running a metal roofing panels manufacturing facility is quite costly, and all work must be coordinated between the guys that make the panels and the sheet metal shop. Most of the time, to simplify things, the roll-forming machine is located in the shop, on the transportable trailer, and is only taken to a job-site when the job is far from the shop, and panels are too long to be transported by conventional means. 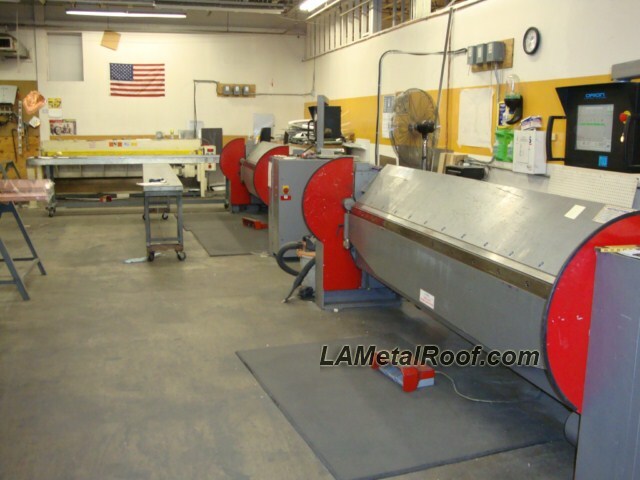 Often, metal roofing contractors who own a roll-forming machine, and manufacture their own standing seam panels, employ an independent sheet metal shop to produce their flashing and accessories, as running a fully equipped shop can be afforded only by bigger, commercial size roofing contractors. We will actually skip the process of converting iron ore into iron / steel, processing and purifying it, etc. Instead, we will start with manufacturers of sheet metal roofing coils, and what they do. 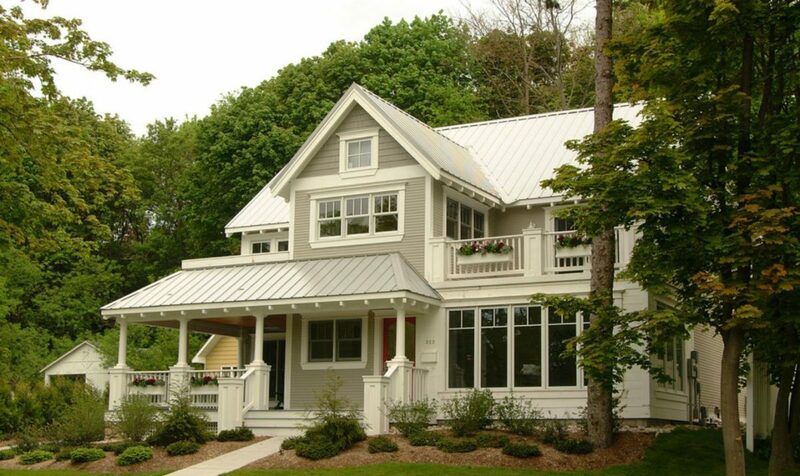 First of all, metal roofs can be made from steel, aluminum, zinc, copper, and even stainless steel. However, galvanized steel and aluminum are the most popular metals, and we will concentrate on these two. There are about four or five large suppliers of metal roofing coil in steel, and two or three in aluminum, with smaller players picking up the slack. All of these guys basically take a thick metal coil, and run it through rolling machines, to reduce the thickness to a required grade – usually 29, 26, 24 and 22 gauge in galvanized steel, and .032″ / .040″ in aluminum. The steel coil also undergoes a hot-dip galvanization process, where the coil runs through a pool of boiling galvanic mix of molten zinc (G-90 galvanization) or a mixture of zinc and aluminum (Galvalume). Once the coil is dipped in the hot galvanic metal, a thin galvanization layer is formed all around an otherwise highly corrosive steel. Then the coil is run through an annealing machine, which is basically a hot furnace with cooling tubes and ammonia gas inside the chambers. Annealing softens the metal, which can then be easily rolled down to the required thickness. Aluminum coils do not require galvanization and just go through an annealer machine, before getting rolled down. Applying Solar Reflective Paint (Kynar 500) is done once a metal coil has been galvanized and cleaned. The coil is then fed into a special “painting machine”, which is a series of separate units, each responsible for its own operation. First, the coil is thoroughly cleaned and dried. Then it goes through a primer application chamber, where primer is applied to both sides of the coil. Then it goes through a baking chamber where the coil is dried at a high temperature, and primer is baked on. Then another primer and bake-on drying process happens for better, more even primer application. Once the coil has been primed, and primer has cured in the “baking” chamber, it goes through the painting cycle, which is essentially the same as priming, only the main color is added to the coil in two layers on top. Usually a white coat is added to the underside of the coil, which once again goes through the baking / drying cycle. 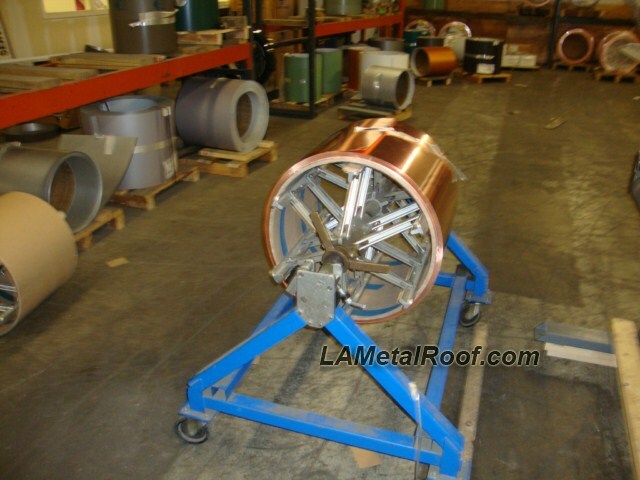 Once the coil is painted, it gets shipped to various metal roofing manufacturers such as Englert, Fabral, PAC CLAD, etc. – These guys slit the coils to their standard widths and cut them into smaller coils – usually 1,000-3,000 lbs., instead of huge 10,000 lb. coils, which come from coil manufacturers. These smaller coils are then either formed into different types of metal roofing panels or sold off to smaller sheet metal shops or contractors with roll-forming machines, who either install them, or resell them to metal roofing contractors. The bottom line here is that most standing seam metal roofs are virtually the same product, as most of them use standard Snap-Lock or Mechanical Lock profiles (under different names of course), and the coil usually comes from the same three or four places. The difference is in price, warranty and manufacturer-specific custom panel profiles. Other than that, as long as the coil comes from a household-name supplier, it does not matter who produced your metal roof. What really matters is the quality of installation. Then again, I myself have seen aluminum metal shingles with chipping and peeling paint. On one roof made by a company out of Canada, each shingle had paint peeling off at exactly the same spot as others, which leads me to believe that the coil was not painted properly on one side. Another example is of another, smaller metal shingles “manufacturer” out of Canada, whose aluminum metal shingles would also lose paint, as it would easily come off when scratched with a finger nail. This manufacturer would not warranty the product, and stopped responding to the complaints of the homeowner. The two examples above indicate that a proper warranty is still important and you want to have your metal roof come from a respectable company that will honor their warranty obligations. Just to give you some peace of mind, these cases with paint defects are EXTREMELY rare, and most steel metal roofs (especially the cheaper 29 gauge steel with acrylic paint) will rust before the paint comes off. — That’s why it’s important to buy a premium product, if you want a premium service out of your metal roof.